The Rotary Club is joining with Haiti’s Smallholder Farmers Alliance to reforest and boost agricultural productivity in rural areas of the Caribbean island nation, where massive deforestation is seen as a root cause of chronic poverty. SFA and local smallholder farmers in the area around Gonaives in northern Haiti will begin building a new tree nursery this month, funded in part by donations from US Rotary Clubs in Bentonville, Arkansas and Exeter, New Hampshire. That will be the first phase of a project that will see local farmers grow, transplant, and look after trees in return for seed, tools and agricultural training that will help them improve their crop yields, SFA co-founder Hugh Locke explains in a blog post. SFA has had tremendous success in using its innovative model for sustainable development. Initial success applying it in northern Haiti smallholder farming communities in partnership with Timberland has led to new, broader-based international campaigns and programs. SFA calls its sustainable agro-forestry and rural development model “tree currency.” Applying it in the field, Haitian smallholder farmers have increased crop yields an average 40 percent and their household incomes an average of between 50 and 100 percent, Locke highlights. 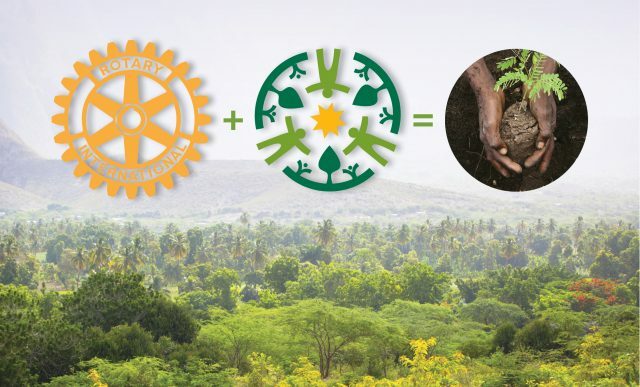 The reforestation and smallholder farmer agricultural development partnership with the two US Rotary Club chapters lays the foundation for a global grant that SFA anticipates with include Rotary Club chapters in other US cities, as well as in Gonaives. Timberland, the Rotary Foundation, and Rotary International are other prospective participants, according to Locke. The main focus of the global grant funding would be to link reforestation work carried out by smallholder farmers with cotton production. By planting and cultivating trees they will earn the cotton seed, tools and training they’ll need to grow cotton for export and purchase by Timberland. Locke announced the SFA-Rotary Club partnership last week while addressing more than 25,000 Rotarians from some 175 countries who had gathered in Toronto for their annual international convention. Just a few days earlier SFA announced a public-private reforestation partnership with the Haitian Ministry of Agriculture. The unveiling of a new signpost reading, “Let’s together protect trees – trees mean life for all of us,” erected on the road leading into Gonaives marked the launch of the project. 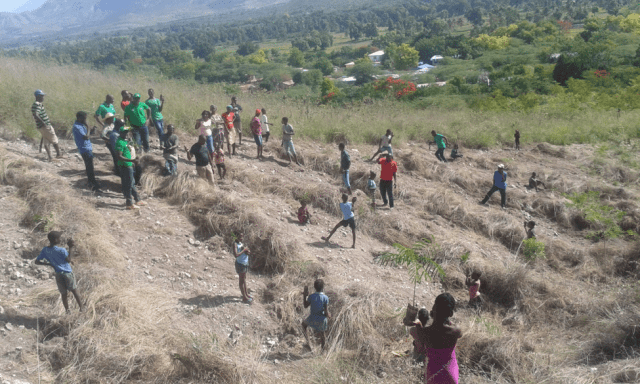 Ministry of Agriculture, Ministry of Environment and Gonaives city officials, SFA members and others also made their way to the nearby farming community of Terre Rouge and joined with local, smallholder farmers to plant 100 trees. SFA has implemented its model of tree currency in the area since 2010. Trees are planted to create orchards alongside roads to serve as buffers, as living fences on fields, and on slopes to prevent soil erosion and flooding. 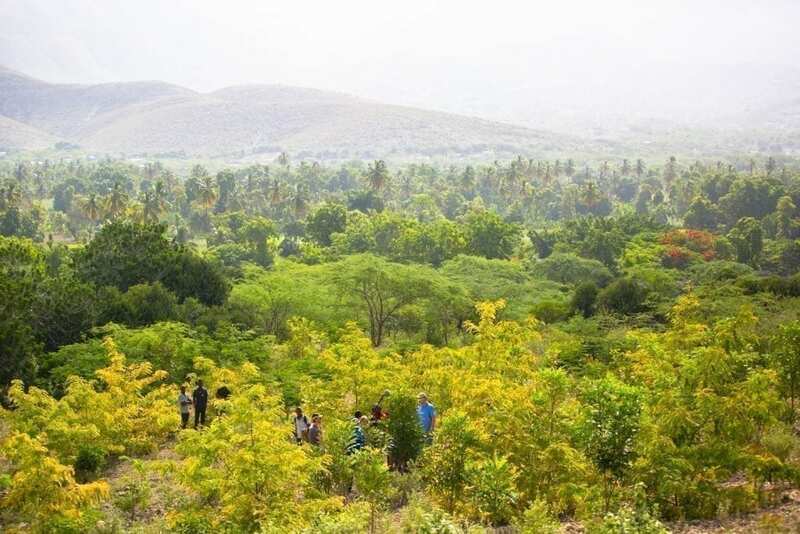 Program participants are looking to connect several of the reforestation-agricultural sites near Gonaives to form the first green belt of its kind in Haiti.